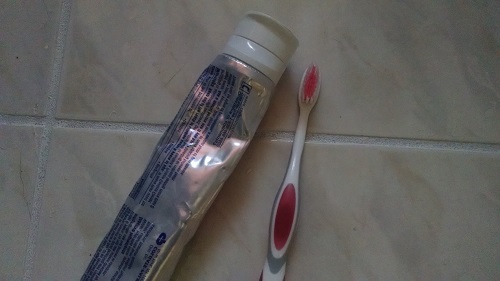 ﻿Use toothpaste and an old toothbrush to easily clean and brighten grout. Use only the white paste as the colored gel may stain your grout. Just squeeze the paste along your grout lines, let stand a few minutes and then scrub with an old toothbrush. Be sure and wipe with a clean, damp cloth as you go otherwise you’ll have a dried-on toothpaste mess to clean up. Not fun! Extra Tip: If you have an old battery-powered toothbrush around, it will help speed up the process. Probably worth the $5 investment to pick one up for this purpose. Mark it well and store with other cleaning supplies so no one accidentally gets a nasty surprise! If you are like me and are fairly blind without your glasses or contacts, this tip is for you. Have you ever put a heaping handful of conditioner on your hair thinking it was shampoo? Well no more! 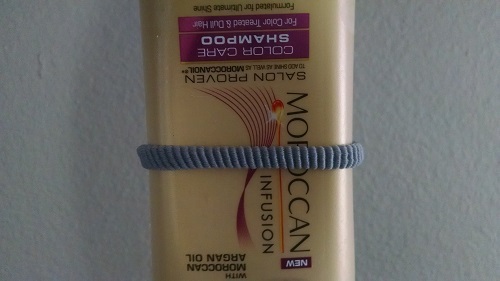 Simply take a rubber band and place it around the shampoo bottle. Problem solved. No more squinting in the shower and sometimes guessing wrong! ﻿Did you know that you can use Dawn Dish Soap to clear a greasy clog from your kitchen drain? Well, you can. Simply pour ½ cup down your clogged drain, let stand for about a half an hour, and then flush the drain with very hot water for a good five to ten minutes. Extra Tip: If you make it a habit to do this to your drain once a month or so, you can most likely avoid the clog all together! Cleaning the inside of your microwave is the worst! But this trick makes the task much easier and you won’t have the smell of a commercial cleaner on your food after cleaning. Simply take a damp, folded hand towel and place inside the microwave, run microwave on high for a minute and the steam that comes from the damp towel will loosen the grime inside. Be sure when you remove the towel you use an oven mitt or tongs. It will be hot, hot, hot! Wipe clean with paper towels and you are good to go! Here’s an easy trick to help remove scuff marks off your floor. Take a tennis ball and carefully cut an X in it with a utility knife. Insert a broom or mop handle into the X and rub the tennis ball on scuff marks to help remove them. You can also use this to remove dried paint or food drips from your floor, but you may need to dampen those areas and let stand for a minute before you scrub. And that completes my 10 favorite household tips! Even if you only discovered one you didn’t know before, hopefully it will help you save time, money, and energy. With the busiest time of the year coming up that could be one of the best gifts you get!